A kitchenware company and an app for tracking shots on a basketball court couldn’t be more different. Yet, somehow the two wound up with nearly identical logos. Such is the case for HomeCourt, whose shining moment Wednesday at the Steve Jobs Theatre got upstaged on social media after Australian company Hutch Kitchen pointed out the similarities. HomeCourt is a shot tracking iOS app for basketball players that uses artificial intelligence. HomeCourt was an ideal presenter at Apple’s fall product showcase for demonstration on one of the new iPhones featuring the A12 Bionic chip. The presentation included basketball Hall of Famer Steve Nash, one of HomeCourt’s investors, and NEX Team co-founder David Lee, both of whom stood in front of a backdrop flashing the app logo. The app’s initials H and C are configured to form a basketball court. 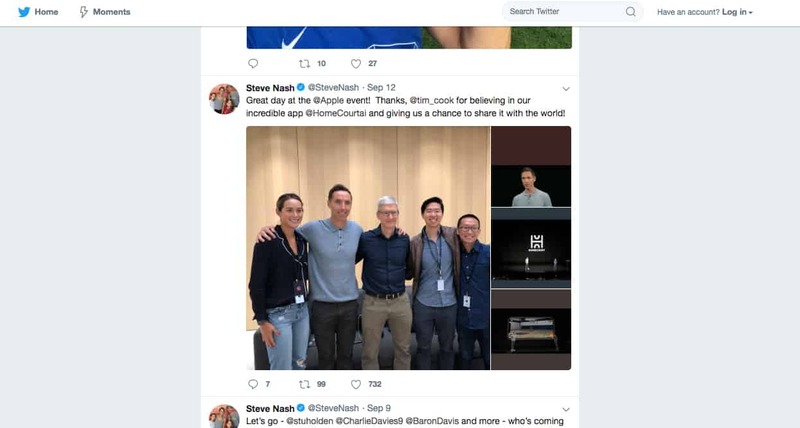 Steve Nash and the founders of NEX Team with Tim Cook. The flap started when a graphic designer tweeted praise for the design. Then Hutch Kitchen chimed in on Twitter showing the logos side-by-side. The Hutch logo appears to have the HomeCourt icon framed in a box, the only difference. The website DesignTAXI said the Hutch Kitchen logo includes a “stylized” K. If there is, a K isn’t apparent to this blogger’s eye. HomeCourt is the first product from AI startup NEX Team. It is already in use by several NBA teams.